This Carnival asked graveyard rabbit bloggers to write their epitaph as they would like it written. When walking through cemeteries, it is fun to read the epitaphs inscribed on the markers. As my marker, is already in place and it shares the information for my parents and is a flat marker, there will be no place for an epitaph. If I was going to have an epitaph, perhaps, it would read. "Janet the researcher, loving aunt and sister"
Henry F Stiver is the father. He was born about 1863 in Markham, Ontario. 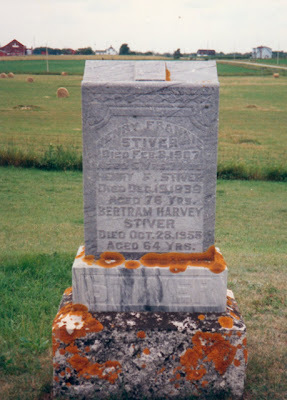 He was the son of Edward Stiver and Rosanna Elizabeth Dickson. Henry Frank Stiver Ontario birth registration #039286 (27 August 1901); digital image, Ancestry.ca (http://www.ancestry.ca ; accessed 20 October 2009), citing microfilm MS 929 reel 155, Archives of Ontario, Toronto. Bertram Harvey Stiver Ontario birth registration #015111 (28 June 1891); digital image, Ancestry.ca (http://www.ancestry.ca ; accessed 20 October 2009), citing microfilm MS 929 reel 104, Archives of Ontario, Toronto. Last week,I was at the Toronto Necropolis and Crematorium doing work for a client. I had made an appointment to see the records and see where my client's uncle's ashes were interred. The client had made the initial contact. As always, I learned something new that I would like to share. I will not name names because of privacy reasons. The Necropolis has two large registers - one details the burials and one for the cremations. These books are very large in size in all dimensions. No., name of deceased, age in years, months, days, place of birth (not often filled in), where and when died, when cremated, cause of death, coroner signing certificate, Name, address and relationship of applicant, funeral director and disposition of ashes (whether ashes taken away and date, or reference of location of burial). Some of the burials of cremains are in the ground while others may be in niches. One code of interest was CBP = Common Burial Plot - Twenty burials of cremains will be in the area 10 across in 2 rows. 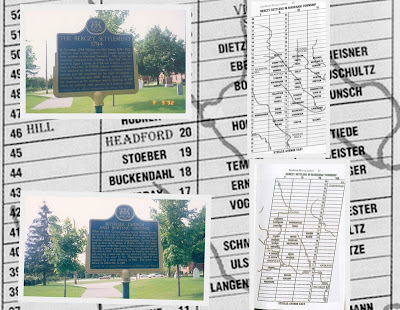 There is a burial map that would show the exact location within this area of each individual. A small cement marker with a number shows the location. On the tree in the area indicates the Section. Although, it was a chilly morning we took time to stroll around some of the grounds. I will post some more photos another day. Today's Tombstone Tuesday over at Janet the Researcher is also from this cemetery. Necropolis = Greek for "City of the Dead "